Disclosure: I received free samples from LorAnn oils in exchange for writing this post. All opinions are awesomely my own. I bought you malasadas last week, and this week, you’re going to love me even more because I saved them, let them go stale, and made them into something extra awesome. 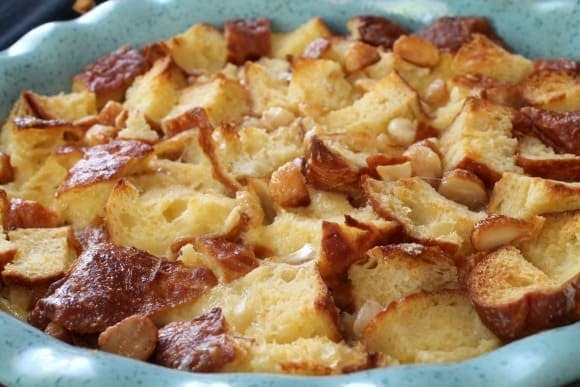 I made you Maple Macadamia Nut Malasada Bread Pudding. See, malasadas are completely awesome when fresh, but they don’t hold up for very long. Eating a day old malasada is just a little sad. Then I thought, if Paula Dean can make bread pudding out of Krispy Kremes, why can’t I make bread pudding with malasadas? And then when LorAnn Oils sent me a free sample of their maple flavoring oil, everything came together in my mind and then in my oven to create one outrageous dessert. Stale malasadas get soaked in a creamy, maple custard, topped with macadamia nuts, baked in the oven until puffy, and then topped with a maple cream glaze that tastes exactly like the frosting on a maple bar. I recommend eating it warm. It’s part soft and squishy, part crunchy and chewy, creamy, sweet, and completely awesome. And here’s the super awesome thing about that maple oil. The flavoring is intense, so you only have to use a tiny bit to flavor the whole dessert. That means one bottle will last forever, which means you don’t have to spend a ton of money. I also have some more flavors to try out, which means I get to create more craziness for you, and that’s basically my favorite thing. You know wasting food and wasting money are basically the same thing. If there’s a way to save it, and turn it into something just as good or better, you’ve got to go for it. 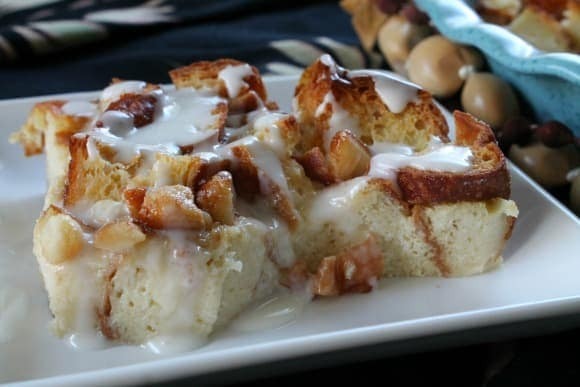 Maple Macadamia Nut Malasada Bread Bread Pudding is rad! Chop your malasadas into bite size pieces and spread them out a 9-inch pie pan. Scatter your chopped macadamia nuts over the top. In a mixing bowl, combine eggs, brown sugar, cream, milk, and maple oil. Whisk until combined. Pour your egg and milk mixture over your malasadas. Press the malasadas down into the custard to make sure everything gets good and soaked. Let it sit for about 20 minutes. In the meantime, preheat your oven to 350. After the soaking time is up, bake for 40 minutes until puffy and ever so slightly wobbly. Let it cool off for about 10 minutes. Serve warm with the maple glaze below. In a small bowl, stir together powdered sugar, cream, and maple oil. You want a relatively thick glaze. It should plop off your spoon, not pour. 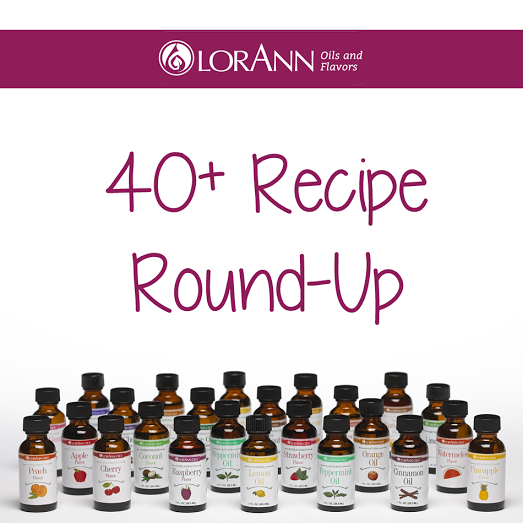 Be sure to check out all my blogger pals who tested out their LorAnn oils and made you something awesome! 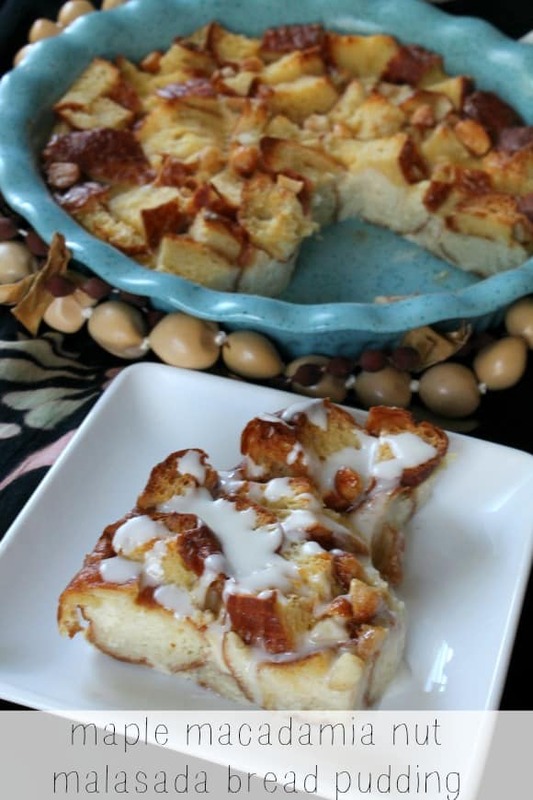 Oh my goodness, you had me at bread pudding! This looks amazing! Mahalo! I hope you try it out! Another glorious fall-inspired dessert! Thanks for experimenting and creating with our Maple super strength flavor! Mahalo! I can’t wait to try the only flavors. What an awesome product!! !